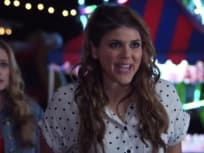 "I'm the Kind of Girl Who Found Her Voice in College"
On Awkward Season 5 Episode 13, Jenna's newfound confidence is rattled when she realizes she's not the only one who's changed while away at college. "Holding On and Letting Go"
Sadie isn't allowed to walk during the graduation ceremony and is angry when she runs into Sergio once again on a brand new episode of Awkward. Everyone plans for a memorable last night of high school and Matty and Jenna finally end up back together but for how long? Find out on a brand new episode of Awkward. 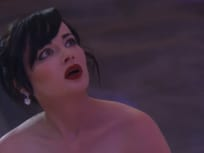 The senior prom does not go according to plan as Jenna's night as Cinderalla encounters a puddle of vodka on a brand new episode of Awkward. "Say No to the Dress"
Jenna has to overcome many obstacles in the hopes of having her dream prom, but not everything goes to plan on a brand new episode of Awkward. As everyone prepares for prom season, Jenna and Tamara attempt to figure out how to avoid the drama on a brand new episode of MTV's Awkward. 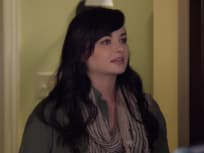 Jenna makes a decision as she comes to the conclusion that she has to tell Matty the truth about how she feels on a brand new episode of Awkward. Tamara accuses Jenna of sabotaging her relationships while Jenna decides to go and confront her ex-boyfriends on a brand new episode of Awkward. Jenna throws a party to celebrate Tamara's fake engagement and Gabby shares information that has Jenna looking for the truth on a brand new episode of Awkward. "Now You See Me, Now I Don't"
The past comes back to haunt Jenna as Theo and Cole unleash the new year book that sets out to destroy the school with the harsh comments on a brand new Awkward.